Ladbrokes has been running a series of trips to visit different sites classified as the 7 wonders of the world. The February trip has already been awarded and in this month of March, you are offered with another chance to claim a trip to Peru. How do you do this? Play, play and play more! Why is Ladbrokes doing this? They are on a quest just like any other online casino to retain their player base. This is the reason they are always coming up with innovative and attractive goodies for their players every now and then. 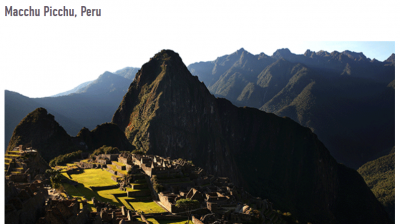 This trip to Peru is the last of the Seven Wonders of the World series carried out by Ladbrokes. The series has seen 6 lucky winners who have won trips for two to destinations offered by Ladbrokes. Some of these destinations were India’s Taj Mahal, Rome’s Coliseum, Petra ancient City-Jordan, as well as, the great wall of China. The month of March holds the offer to the final destination. The destination this time will be to Machu Picchu in Peru. The package for the winner consists of two business class flight tickets to and from Peru, seven night stay at a fancy hotel in Peru fully paid and £1,000 in spending money for the trip. What should attract you to participating in the quest to win this trip? The highlight of the trip will be the visit to the mountainside Machu Picchu which has been classified as a world heritage site by UNESCO which is known to be the last remnants of the Inca Civilization. This is one of the greatest places to visit while in Peru but if you wish not to visit the site, you can remain in Peru’s capital; Lima. Throughout the month of March, as a registered Ladbrokes casino player you will have the chance to get a draw ticket on £50 you wager in the casino on any slot game. All players will as well receive a ticket to the draw on the house upon clicking on the “Claim Now” tab which is on the Seven Wonders of the World offer page on the website. The draw for this trip will be held on April 1st, 2015. Other players will as well benefit from the promotion as Ladbrokes will also be handing out a shared amount of £1,000 to 100 runner ups in this Peruvian draw. The cash prizes will range from £5 to £50. Ladbrokes Casino is always doing its best to impress its players. With this 7 Wonders of the World promotion, they have awarded 6 lucky winners and the 7th one will be known in a month’s time. These are not the only promotions they are running, they will have more after this.